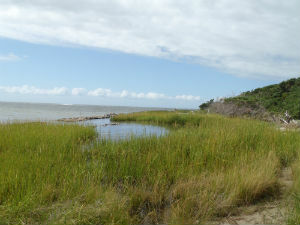 Beginning in 2012, the North Carolina Coastal Federation partnered with the North Carolina Coastal Land Trust to restore a portion of the shoreline at the Springer’s Point Nature Preserve on Ocracoke Island. 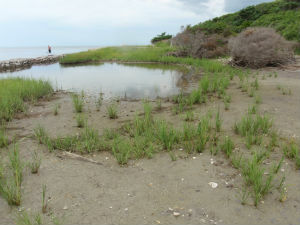 Building a new sill of bagged oyster shells along the eroding edge of the shoreline, maintaining the existing rip-rap structure and adding more native marsh grass allowed the shoreline and marsh to begin to stabilize. The federation and the land trust hired contractors and local fishermen and volunteers from the local school and other community groups pitched in to get the job done. The partnership will continue to monitor the project and take adaptive management steps, if warranted. Funding for this work was provided by U.S. 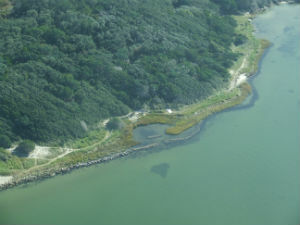 Fish and Wildlife Service’s Coastal Program, NOAA’s community-based restoration partnership with Restore America’s Estuaries, and private donations. The federation continues to monitor the shoreline and fine tune the sill design as necessary. 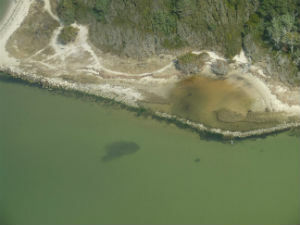 Aerial photographs of the site (above) courtesy of N.C. Division of Coastal Management.